Despite the well-documented dangers of using a mobile phone while driving, more and more drivers are guilty of “manipulating” their devices while driving—up 57 percent compared to 2014, in fact, according to a survey done by the US-based Insurance Institute for Highway Safety or the IIHS. According to the IIHS, simply manipulating a mobile phone contributed in more than 800 crash deaths in the US alone. This is compounded by the fact that more and more drivers find “distracted driving” a much bigger problem today than it was 3 years ago. 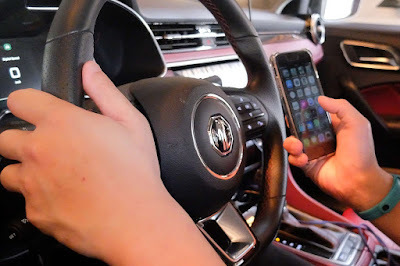 Aside from being illegal, including in the Philippines with Republic Act 10913 or the Anti-Distracted Driving Act, drivers who manipulate their phone increases their crash risk by 66 percent. The IIHS notes that mobile phone use affects how drivers scan and process information from the roadway. Drivers generally take their eyes off the road to dial, send texts, and browse the web on a hand-held phone—all activities that fall under the rubric of manipulating the phone. Drivers engaged in cellphone conversations tend to concentrate their gaze toward the center of the roadway, but their attention still may be diverted from driving and make it difficult for them to process what they are looking at. About 14 percent of drivers were engaged in non-phone-related secondary behaviors in 2014 and 2018, which exceeded the proportion of drivers seen using phones in both years. Relative to 2014, drivers were more likely to be observed manipulating an in-vehicle system, grooming themselves, or manipulating or holding an electronic device other than a phone after researchers adjusted for community, perceived driver gender and age, time of day and roadway situation.